Towers and hexagonal structures have also been built on the islets in recent months. Chinese dredging vessels are purportedly seen in the waters around Mischief Reef in the disputed Spratly Islands in the South China Sea. WASHINGTON (Reuters) - Recent satellite photographs show China appears to have built reinforced aircraft hangars on its holdings in the disputed South China Sea, according to a Washington-based think tank. Pictures taken in late July show the hangars constructed on Fiery Cross, Subi and Mischief Reefs in the Spratly islands, have room for any fighter jet in the Chinese air force, the Center for Strategic and International Studies (CSIS). “Except for a brief visit by a military transport plane to Fiery Cross Reef earlier this year, there is no evidence that Beijing has deployed military aircraft to these outposts. But the rapid construction of reinforced hangars at all three features indicates that this is likely to change,” CSIS said in a report. Activists protest over the South China Sea disputes in front of a Chinese consulate in Manila. The images have emerged about a month after an international court in The Hague ruled against China’s sweeping claims in the resource-rich region, a ruling emphatically rejected by Beijing. The United States has urged China and other claimants not to militarize their holdings in the South China Sea. China has repeatedly denied doing so and has in turn criticized U.S. patrols and exercises for ramping up tensions. 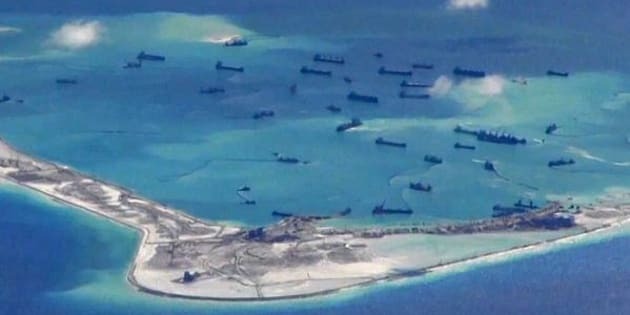 “China has indisputable sovereignty over the Spratly islands and nearby waters,” China’s Defence Ministry said in a faxed response to a request for comment on Tuesday. China's air force has begun conducting combat air patrol over the disputed areas of the South China Sea. Ties around the region have been strained in the lead-up to and since The Hague ruling. China has sent bombers and fighter jets on combat patrols near the contested South China Sea islands, state media reported on Saturday, and Japan has complained about what it has said were multiple intrusions into its territorial waters around another group of islands in the East China Sea. The hangars all show signs of structural strengthening, CSIS said. Other facilities including unidentified towers and hexagonal structures have also been built on the islets in recent months, CSIS said.